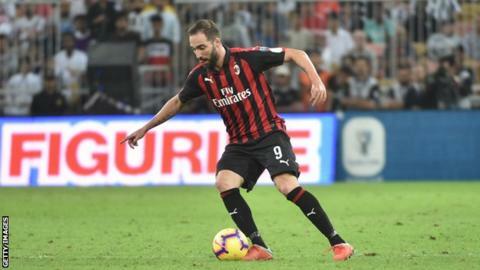 AC Milan's on-loan striker Gonzalo Higuain remains in Italy as the club attempts to secure a replacement for the Argentine before sanctioning his move to Chelsea. The 31-year-old, on loan from Juventus, has not travelled with his team-mates to Monday's Serie A game at Genoa. Genoa's general director Giorgio Perinetti has told Italian radio a meeting over Poland international Piatek, 23, will take place after today's game and a conclusion is expected one way or another within 48 hours. Higuain's spell at Milan began well, with the Argentina international scoring six goals in five games for the 18-time Italian league champions.